"He said there were lights in Crownsville - that nothing good happened when they came here. "THE REVIEW OF WRONG ASSUMPTIONS3.5 stars. I want to go a full 4, but point number 6 is a big reason why I didn't have it in me to give up that extra half point. 1. The Cover made me think this was standard YAPNR fare. You know the type of book - one minute you're swooning over a dangerous young man, the next you're wanting to to beat the ever-loving crap out of a girl for being stupid enough to fall prey to the once-swoony-guy now turned stalker. I was wrong. Although, I'm not going to lie, I do like the cover, even if it SO does not represent what the book is about. A hot guy with an awesome back tattoo on a black and white portrait is not so bad...2. The Summary Blurb led me to believe we were going to be dealing with a major love triangle. After all, the first friggin line of the summary is : Mia is torn between two guys. I decided to read the book because people said it was good, so I went into this deciding not to be too hard on the love triangle. ONLY THERE WAS NO LOVE TRIANGLE. At least, not once you got past the first few chapters, there wasn't. I was wrong.3. I thought from the first 15 or so percent that this was a book about aliens. Boys were disappearing in a barrier of lights - what did you expect me to think?!? Alas, there are no aliens. I was wrong.4. I thought the book was going to keep up with the simplistic and easy style of writing that we encountered on the front end. Please keep in mind that simplistic was not an insult here. I was kind of liking how the book's style of writing reminded me of Cynthia Hand's (Unearthly series) to start. But then a whole lotta WTF?!? started kicking in and that went out the window. Take a dash of Burn Bright (strange world and creatures), a pinch of Angelfall (I ran smack into some creepy moments I wasn't expecting), and a smidgen of Legend of the Seeker (don't sue me for not reading past the first section of the Sword of Truth books, but the barrier dividing worlds felt reminiscent of what I saw on the t.v. series version) and we're walking close to the edge of what was going on here.5. I assumed that the characters were humans with magic abilities. So, it's pretty safe to say by now that I failed a lot.6. I'd assumed this was a series. Who knows, maybe it still will be at some point because Goodreads has been known to add book 2 additions to the database way after the fact. 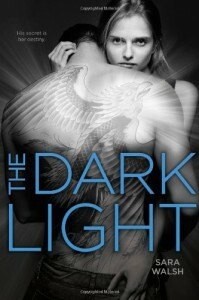 For now, I'm assuming that Dark Light is a standalone. The ending was wrapped up nicely but there was enough wiggle room to come back with another installment. Here's where I'm going to register my one and only gripe. It may only be one gripe, but this is kind of a big one : I think there was too much information crammed into one book. There were too many people, too many creatures, too much world building and rules and lore, etc. to have to learn for ONE book. Even though I was fascinated by how unique the story was, I didn't want to have to learn EVERYTHING about Sol and Mia's backstory in one book. If this truly is the end of the road, I will say that the execution of facts should have been spread out between a trilogy, with a few extra adventures thrown in. As it stands, something about the ending feels a little too convenient. 7. I assumed that I'd have fun reading this book. Okay, so that was my only right assumption. This book was fun! Other than my complaints about too much info dumping, I appreciated the one-of-a-kind world. And I looooved (yes, the 4 o's were necessary) Sol. His passion for his people and land reminded me of my steadfast obsession with Dimitri Belikov. Maybe not at the same epic level, but Sol was more than just a hot guy. He had great strength of character. Okay, so there was a land called Brakaland (I kept calling it boom shakalaka in my head) and a person called Bromasta (really? The bro-masta??? ), which were so out of place for a sci-fi turned fantasy type of book, but whatever. Call me wrong if you want to, but my final genre decision will be that this starts out as a science fiction type of story and evolves into a fantasy. I wouldn't call the book a pnr. If that's what you want out of a story, you'll be disappointed. Expect to have to pay attention to what's going on or you might miss something. If you don't want to invest in that, this probably isn't the book for you. If you like reading about something that isn't the same old story, give this one a shot. It was definitely uh...different. Yeah.Overall, I enjoyed this one!